Obama Drives His Jobs Message To N.C. Crowds President Obama is drawing sharp contrasts between his jobs plan and the ideas put forward by Republicans in Congress, as he continues his bus tour through North Carolina and Virginia. That may not bring his jobs plan any closer to passing, but it does help frame the argument for the 2012 election. President Obama is drawing sharp contrasts between his jobs plan and the ideas put forward by Republicans in Congress as he continues his bus tour through North Carolina and Virginia. That may not bring his jobs plan any closer to passing, but it does help frame the argument for the 2012 election. Obama is urging Congress to pass his jobs bill piece by piece if necessary. And the piece he was highlighting Monday night in an overheated high school gym in Millers Creek, N.C., would use federal tax dollars to help local governments keep teachers and other employees on the payroll. "Let's put teachers back in the classroom where they belong," Obama began. "Let's make sure that we're not laying off police officers and firefighters. And let's help veterans get a job after they've defended this country." Obama scoffed at a rival, Republican jobs plan that would roll back financial and environmental regulations. "The Republican plan says what's standing between us and full employment are laws that keep companies from polluting our air and our water. Our plan, on the other hand, says let's put construction workers back to work rebuilding our roads and bridges and schools," Obama said. The audience in the gym chanted "four more years," just as a crowd did earlier in the day in Asheville, N.C. Obama insists he's not focused on re-election just yet. 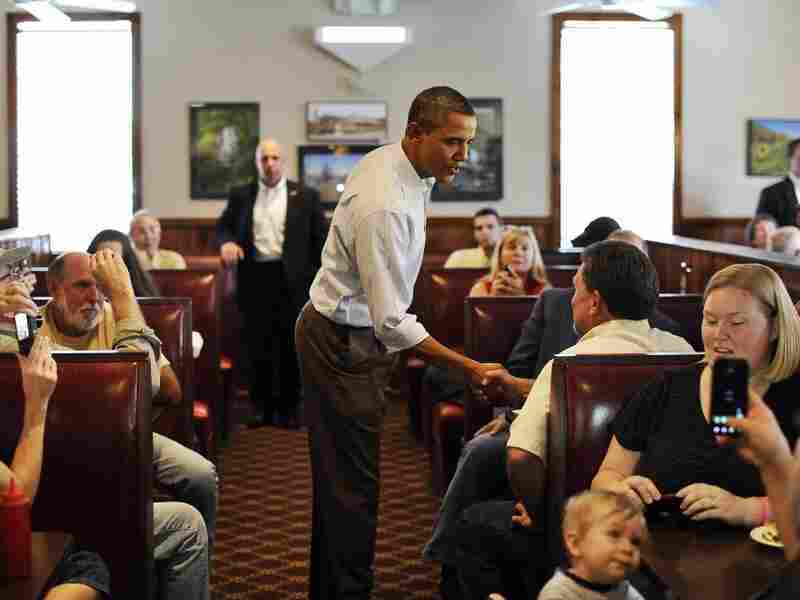 President Barack Obama chats with people after ordering his lunch at Countryside Barbecue in Marion, N.C., Monday, during the first day of his three-day American Jobs Act bus tour to discuss jobs and the economy. "Look, I appreciate the 'four more years,' " Obama said. "But right now, I'm thinking about the next 13 months." But it's clear the president has at least one eye fixed on November 2012. In between formal jobs speeches, the president spent a lot of time just cruising the blue highways of the state looking for hands to shake, babies to kiss and maybe a bit of good barbecue. Pork chops and okra was the daily special at Countryside Barbeque in the small town of Marion. The lunchtime crowd included cops in uniform, teenagers in work clothes and a group of senior line dancers like Jewell Randolph. "It was a joy to get to meet him and get my picture made with him," Randolph says. As the president's motorcade wound through the central part of the state, some people waved flags or Obama campaign signs. But others greeted the president with a thumbs down or, in some cases, a cruder gesture. North Carolina is still challenging territory for a Democrat, even if Obama eked out a narrow victory here three years ago. Political scientist Thomas Carsey of the University of North Carolina says if the president can stay competitive in the region, he'll have that many more chances for holding on to the White House. "If we're fighting the battle in October and November of next year in places like North Carolina and Virginia, that's going to bode well for the Obama campaign," Carsey says. "On the other hand, if North Carolina and Virginia look like they've slipped out of reach for the Obama campaign 12 months from now, that's going to signal that they're really in trouble." A big turnout among young voters helped Obama carry North Carolina in 2008. 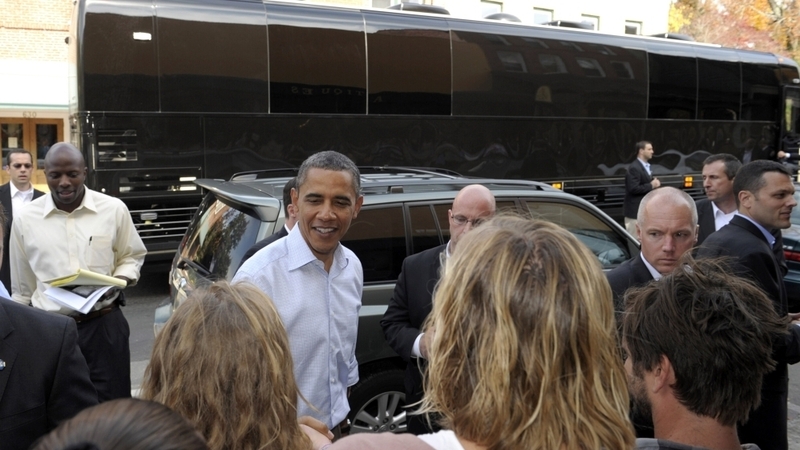 So college student Marcus Miller was hardly surprised when the president's bus pulled up outside Appalachian State University, and Obama got out to shake some hands. "It's a liberal college, so everybody around here, I'm pretty sure, voted for him in the last election," Miller says. Nicola Hesterberg still backs the president, but he admits that enthusiasm for Obama on campus has waned. "Some people are kind of like, he hasn't lived out his promises," Hesterberg says. "It's hard for him with everything going on in Congress. And I don't hold that against him. My thing is, his intentions are good, the direction he's going is good, so even if he's not actually accomplishing it, he's still pushing for what he believes in." That's the underlying theme of what might be called the "good intentions" bus tour, and a pretty good road map for Obama's 2012 campaign.